The foundation of the church is directly linked with Tsar Ioann Vasilievich. He is more known as Ioann the Terrible since the contemporaries called him so. On October 4, 1552 (according to the Julian calendar), two days after the seizure of <?xml:namespace prefix = st1 ns = "urn:schemas-microsoft-com:office:smarttags" />Kazan, Tsar Ivan solemnly entered the conquered town. Here and there there were died soldiers and the Tsar commanded to bury them properly. The order fulfilled Abbot Ioakim, who came together with the tsar. 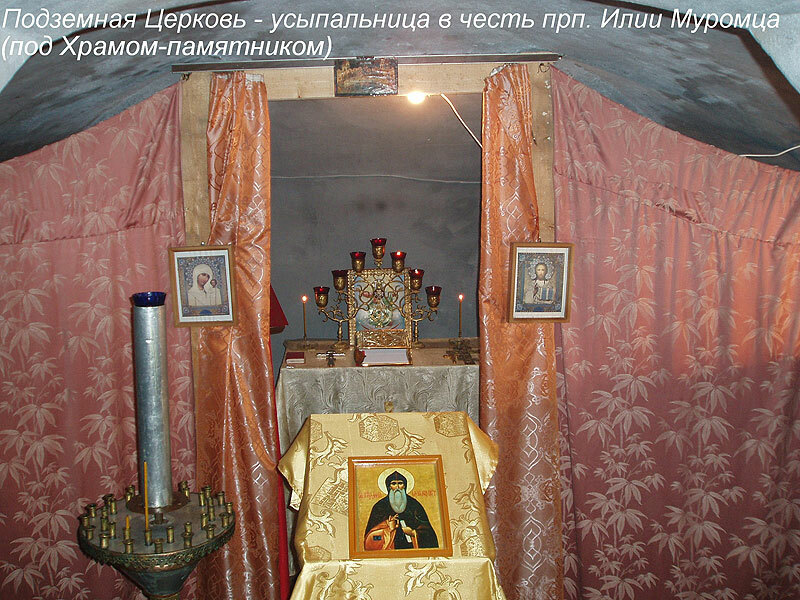 On the same day at the place of common grave, which was called “Russian cemetery”, the tsar ordered that a monastery in honor of Dormition of the Theotokos should be established and the monks should eternally pray for the killed troops. 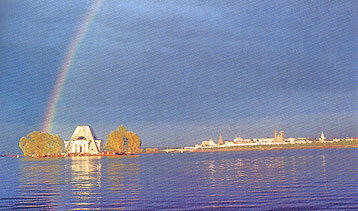 The monastery was situated on a high right bank of the river Kazanka (actually location of the Memorial Church), and, unfortunately, spring floods began to undermine it. Extremely high water of 1559 caused severe destruction of monastery wooden buildings including the church. With the request of Abbot Ioakim Tsar Ioann IV ordered that the monastery’s location should be translated a kilometer down-stream the river Kazanka on a high hill called Snake-Zilant, where his first quarters with the colors of image “Not-made-by-hands” and a field church were situated. With the tsar’s official document of 1560 came money – 300 rubles donated the Tsar and 100 rubles Tsarina Anastasia. She also sent a whole iconostasis for the cathedral church. On a high hill, which arose after burial, a chapel was erected while memorial services were held in the monastery on Zilant hill. The Synodikon with the names of all died soldiers has survived. These names were remembered during memorial services. This book has been reprinted several times, and it was possible that time to read out each name of heroes. Exceeding 800 noblemen from different towns of the Russian State are mentioned in the Synodikon, but obviously, the total number of buried soldiers comes to several thousands. In 1809 from the monastery of Intercession in Simbirsk town to the Dormition Monastery on Zilant hill was moved up Archimandrite Amvrosy (Sretensky). It was a man of high education and full of activity. He possessed a rich collection of books; some theological works written and printed by him have been left after him. After victory over Napoleon a wave of patriotism rose in Russia, monuments in honor of Russian arms and heroism began to be erected. Amvrosy decided to build at the place where the chapel was situated a monument in form of a pillar at his own expense including donations. Five thousand rubles were collected. In 1812 the design of the pillar-monument was introduced to Emperor Alexander I. He liked the idea but he entrusted a well-known architect of Moscow Alferov with making over the project. Alferov only created the design, supervisor over construction of the monument was the architect of the province A. Schmidt. It was he who carried out revetment of walls with white stones. In 1813 the Emperor approved the design, and donated from his own possession five thousand rubles as much as the Royal family did. The common help of the nation added to it some more 100.135 rubles. The foundation of the monument was solemnly laid on June 29, 1813. The financial matter was the most difficult. As it was later found out, realization of Alferov’s design needed expenses of 100.315 rubles. This sum was extremely high not only for the Zilantov monastery, which was not quite rich, but also for the Diocese of Kazan (e.g. construction of a good stone church cost about 10.000 rubles that time). The monks of the Zilantov monastery went for collecting money during the whole period of construction to Saint Petersburg, Moscow, provincial towns, and to the trade fair in Nizhny Novgorod. The means had been collecting slowly, and the construction was delayed to 1823. By the summer of 1823 construction of the monument and works on interior of the church had been completed. On August 30, 1823 it was consecrated by Amvrosy, archbishop of Kazan. 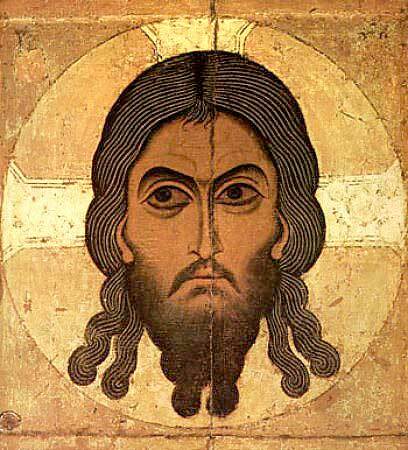 The Church was sanctified in the name of the image”Not-made-by-hands” of our Lord Jesus Christ. This image was depicted on the colors of Tsar Ioann IV. 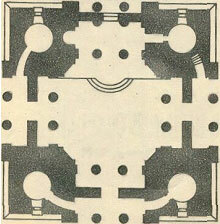 Soon afterwards, some defects in design and calculations were being revealed, and the monument was getting dilapidated. After the death of Archimandrite Amvrosy the governor of the Kazan Province addressed to the town council with petition of taking the memorial church into its support, because, deprived of proper care it was falling into decay. The petition was fulfilled. 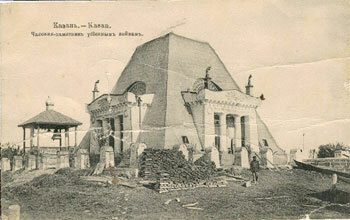 In 1830 the church was closed and works on reconstruction of the monument started. Merchants A. Krupenikov and P. Kotelov were elected as benefactors. Due to the money provided by the Council, the monument underwent total restoration. 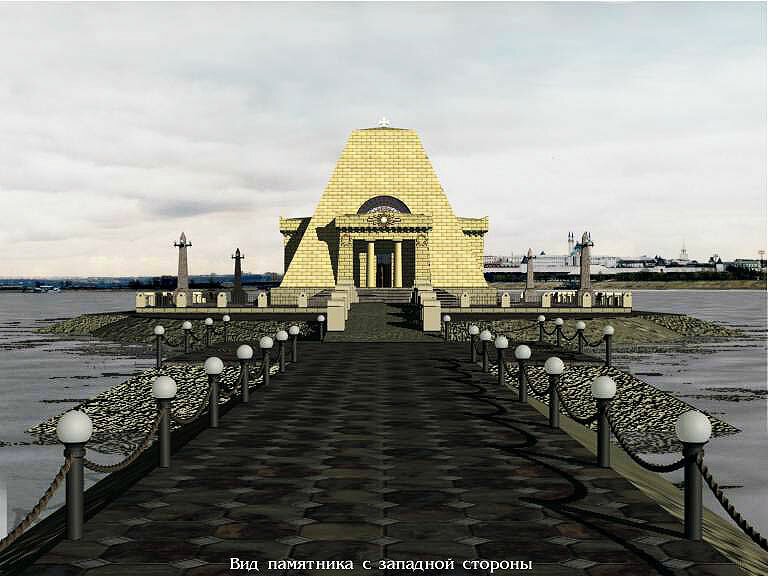 The design was carried out by the architect Pyatnitsky (constructer of Kazan Imperial University). Within two years the works were completed. On October 2, 1832 the memorial church was consecrated anew by Archbishop Philaret. Especially for this festival event Emperor Nikolai I sent as a gift silver sacred vessels. Administratively the memorial church was submitted to the Zilant monastery only for 30 years after its foundation. It was difficult for the monastery to take care of such scaled a construction. The church was handed over into support of military department. On festival days besides religious procession there was organized military review, at which were always present the governor, bishop and respected citizens of Kazan. The day October 2 was considered by common people as a great feast, they called it name day of Kazan. In 1830 the Kazan Assembly of merchants (institution of estate governing) took charge of the monument. Since that time a post of monument warden was established. It was a retired officer with wounds and battle rewards, and he lived near the monument in a wooden house. The town council with recommendation of the assembly of merchants appointed benefactor of the monument. As a rule it was a well-off merchant, who freely incurred maintains expense of the monument. After municipal reform of 1870 the monument was passed into authority of Town council of Kazan. Since that time not the merchants but autonomous bodies of the town took care of it. The posts of benefactor and warden existed till 1917. Archimandrite Gavriil (Voskresensky), Superior of the monastery and a well-known philosophic scientist issued the most detailed description of the monument. He accompanied Emperor Nikolai I during his visit of the monument on August 19, 1836, and a heir of the throne, the future Emperor Alexander II as well (also known as tsar-liberator). Since September 1918 divine services stopped in the church. A disorder of 1924 avoided it. The fact is that in 1924 the VTsIK (All-Russian Central Executive Committee) issued an edict “On Lenin’s perpetuation”. Afterwards some Kazan rulers with agreement of local “historians” decided to use for this object the memorial church, and called it The Monument of Community of Nations. For this purpose instead of the cross a spire in form of a minaret accompanied by viewing platform should have been erected. The spire should have been crowned by Solomon’s star. At the bottom of the assumed minaret, on the church dome there should have been two fellows shaking hands of each other, undoubtedly it should have been a Russian and a Tatar. The inscription “community of nations” was to be placed instead of the earlier “in commemoration of the victory over Tatars, 1552” (by the way, it does not exist for a long time as well as the modeled attributes – St. George’s Crosses which were the symbols of the House of Romanovs). The Lord saved the monument from its propagation. 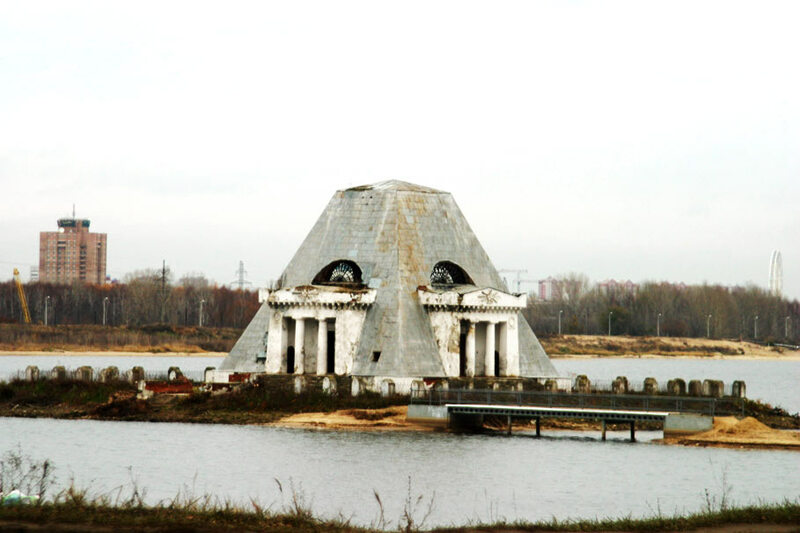 During the Soviet time the authority took care of the monument as it became one of the architectural symbols of Kazan. In 1924 it was renamed into “The Monument in the name of Community of Nations”. A competition devoted to the monument’s reconstruction was announced, but no one of the three presented designs could answer the demands of the town council committee. In 1930 under the guidance of the architect A.Bikchentaev the monument underwent “reconstruction”, it means that the cross was taken down, the inscriptions were knocked down and plastered, from the interior there remained nothing that could remind of the church. Since that time there were not any drastic changes in the history of the monument. In 2001 with the blessing of Archbishop of Kazan and Tatarstan Anastassy a parish of the Image “Not-made-by-hands” of the Lord was established, which rules Fr. Feodor Sitkin. The congregation regularly conducted divine services in front of the church striving for its restitution to the Russian Orthodox Church. 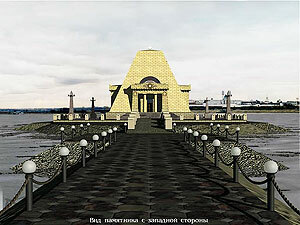 In accordance with the Resolution 8 (17/01/2001) of the Cabinet of Ministers of Republic of Tatarstan “On assignation of an architectural monument of republic-wide importance, the monument to the troops died at the seizure of Kazan in 1552, to the municipal ownership of the Kazan City”, the Ministry of Culture by statement # 688 (23/04/2001) passed it into authority of the Department on current maintenance and development of outward objects accomplishment of Administration of the Kazan City. Answering the letters of the congregation, the authorities reported, “Consideration of the matter about monument’s assignation to the Church would be able only after reconstruction works.” At the same time, despite financing of the monument’s reconstruction according to the Federal program on preparation for celebration of the millennial anniversary of Kazan, restoration design and term have not been fixed and approved yet. The parishioners think that it is their service, that the church has survived, since there were certain presuppositions for sharing the lot of “Old Kazan”, which was pulled down according to the program of liquidation of tumbledown buildings. The memorial church was returned to the Diocese of Kazan of the Russian Orthodox Church on March 4, 2005. After reconstruction works will be completed, it is proposed to use the church jointly by the Diocese of Kazan and by Administration of the Kazan City. Rector of the Church: Fr. Feodor Sitkin. The divine services are held on Sundays and on Feast days.